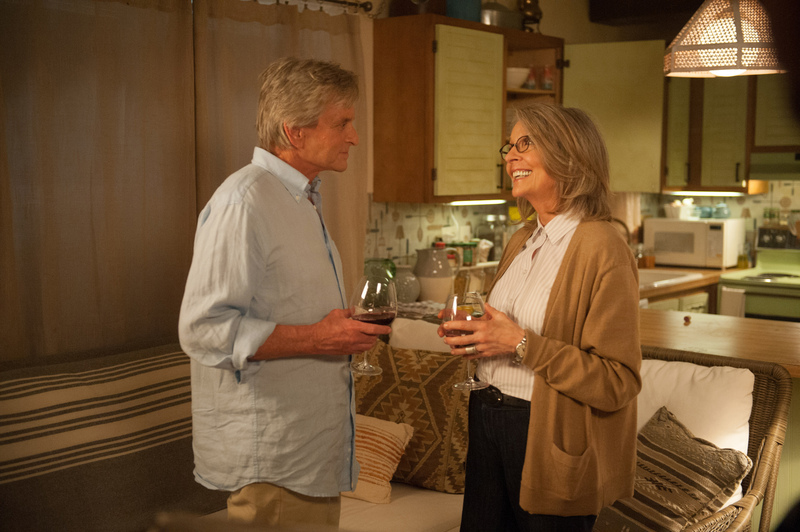 Oren (MICHAEL DOUGLAS) makes a move on Leah (DIANE KEATON) in AND SO IT GOES. ©Clarius Entertainment. CR: Clay Enos. 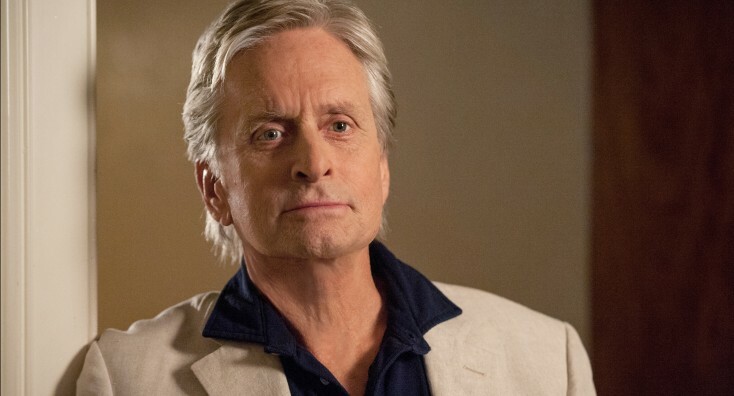 HOLLYWOOD—At 69, actor Michael Douglas has survived illness and family problems but, like his classic movie star dad Kirk, he springs back and keeps on plying his trade. The actor’s latest effort is “And So It Goes,” a quirky romantic comedy by screenwriter Mark Andrus who scored with the 1997 film “As Good As It Gets,” starring Jack Nicholson and Helen Hunt as opposites that attract. In the Rob Reiner-directed “And So It Goes,” Douglas plays Oren, a bitter, rather pompous, on-the-skids real estate agent who asks neighbor Leah (Diane Keaton) for help when the feisty granddaughter he never knew he had is deposited on his doorstep by his estranged son. Speaking with the press recently, Douglas revealed that his first real acting gig was co-starring in a film with “And So It Goes” director-actor Rob Reiner, another son of a famous actor dad (Carl Reiner). They both got horrible reviews, Douglas confesses. Throughout the interview, Douglas sounds like the president of Diane Keaton’s fan club or a guy who, if he weren’t married, might ask her out on a date. His praise is that profuse. After excusing himself for chomping down on a cookie, the two-time Oscar-winner (for his performance in “Wall Street” and for producing “One Flew Over the Cuckoo’s Nest”),is candid in his response to a rather personal question. Q: Rob Reiner said he gave you the opportunity to change the script regarding your son (in the movie) having a drug addiction, and you said “no.” (Douglas’ son, Cameron, has struggled with drug addiction). Why? Douglas: I didn’t know what the alternative was going to be, really. But, I don’t think it’s a secret. I’ve been dealing with it and I didn’t know what we were going to come up with (as an alternative). The similarity is my son (Cameron) went to jail. The son in the movie didn’t go for drug addiction. I remember reading it and smiling and shaking my head and thinking “Things come around in characters.” I only wish my son had had the same situation the character did and was out in eight months. Q: How did you get involved with this project? Douglas: (The script) came in from Castle Rock, Rob Reiner’s production company. Rob was actually going to be doing another movie, and there was a different director associated with this film. Then, that director had insurance problems because I guess he’d gone over schedule on some film, and Rob’s other picture did not work out. I thought Rob should be directing it in the first place but maybe Rob thought it was too much of a “Rob Reiner”-type movie. Diane (Keaton) hopefully was there so, for me, it was a Mark Andrus screenplay. It was always a really good screenplay, and then with Rob and Diane (onboard). I’ve had the joy of experiencing a few minutes of Diane’s charm, and she’s fantastic. I’ve always wanted to work with her and now I have. Q: Well, how was she to work with compared to many of your other leading ladies? Q: Have you and your wife, Catherine Zeta-Jones, thought of doing something together? Douglas: We did “Traffic,” but we really did not have scenes together. Q: You’re not going to do anything together again anytime soon? Douglas: No. No, especially with the kids. It’s the kind of thing where you try to combine all elements. It could be during the summer holidays, and the kids could come with you and it would be all right. Q: It’s a familiar film story to have the two people who clash with each other and then the sparks fly, and then they happily end up together. To make that work is your job. How did you see the part of Oren in this movie? Q: How was working with Rob? Douglas: Rob and I did “The American President” (1995) together, and we got our first acting job together in a movie called “Summertree” (1971), where we played college roommates in 1968. He was recently honored at Lincoln Center with the Lifetime Achievement Award and I pulled out for him “The New York Times” review (for “Summertree”), which pointed out that we gave two of the worst performances probably ever seen on screen before. But we share being in that very small club of second generation sons of (actor) fathers that have succeeded, and there’s not many of us. So, although we never talk about it, that was always there. Rob’s this incredible, funny teddy bear. He’s got a wonderful heart. His foibles are on his sleeve and he’s a great director. He makes you always feel like you are coming up with (ideas). He gives you all the freedom in the world. Q: What did you hope to gain from this experience? Douglas: What I hoped for was a movie where I could go home at night because I don’t live that far away, working with a director I’d worked with before. You get to an age where the comfort factor becomes so important. Then Diane was everything I’d hoped for and a lot more. She’s got this great kind of freedom and doesn’t know what she’s going to do. She says, “I’m not an actress. I’m just here.” She floats in listening to music. She doesn’t hear anything and the camera is rolling. You think, “When is she going to take the earplugs out of her ears?” Then, “Okay, let’s go.” It’s great and unpredictable. Q: “War of the Roses” (Michael’s 1989 film with Kathleen Turner) is coming to Broadway. Would you want to perform a role on stage? Douglas: I did some theater years ago. I always wanted to, and then Catherine was doing “A Little Night Music,” and you have this vision, “Oh to have those kinds of hours versus movie hours.” I say I want to do it but I haven’t. I’m lazy. I haven’t directed since I did “The Streets of San Francisco” (on TV) and it’s probably a question of the time. Acting is a pretty good gig. Directing is such a lonely job and you’ve got to work on schedules and locations. Q: Do you ever just want to stop what you’re doing? Douglas: No. I like what I’m doing. I like my job. I still can’t believe they want you and pay you. People talk about retiring all the time, but when I (reached) retirement age, I couldn’t imagine it.